Flutist Carla Copeland-Burns enjoys an active teaching and performing career based in North Carolina. Noted as a flexible and versatile player, Carla currently performs with the Greensboro, North Carolina, and Salisbury Symphonies as well as the North Carolina Opera, Carolina Ballet, Blue Mountain Ensemble, Mallarmé Chamber Players, and with the performer-composer collective Blue Mountain/Forecast. Enthusiastic about new works, Carla has been a member of commissioning projects and premiere performances with all of her chamber ensembles and as a soloist. She is equally comfortable performing as an orchestral player, chamber musician, soloist, and playing contemporary music in alternative settings. 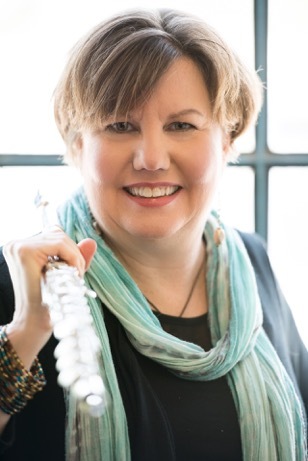 Carla teaches at Duke University and through her home studio, and recently served on the faculty of the University of North Carolina at Greensboro after eight years as Instructor of flute at Radford University. Guest artist-teacher appearances include schools such as the New Zealand School of Music, Auckland University, University of Southern Maryland, University of North Carolina School of the Arts, and Florida State University. She has been a featured performer at National Flute Association Conventions and at several International Double Reed Society Conferences in the US, Canada, and Australia. In summers she has been associated with the New England Music Camp, Eastern Music Festival, and the InterHarmony International Music Festival in Italy and Germany. Her students have successfully auditioned into festivals, competitions, and music schools throughout the US and abroad with many currently working as music educators, music therapists, arts administrators, and performers. Carla has enjoyed performing opportunities under conductors Grant Llewellyn, Gerard Schwarz, Bobby McFerrin, Gerhart Zimmermann, Timothy Myers, Stuart Malina, and Dmitry Sitkovetsky. She has recorded with ensembles on the Albany, Centaur, and Klavier labels and has been heard on several editions of NPR’s Performance Today. Mentors include Charles DeLaney, Lois Schaefer, Carol Wincenc, and Nadine Asin and her degrees are from Florida State University, New England Conservatory, and the University of Cincinnati College-Conservatory of Music (CCM).